Why are people stealing gundogs? 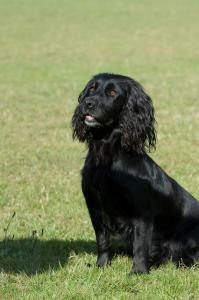 Why are people stealing gundog breeds? The number of missing or stolen gundogs has been on the rise since 2012 when gundog theft occurred on a grand scale across the UK. Some 3,500 dogs (Shooting Times Magazine) were reported stolen from homes, outhouses and kennels during the shooting season, prompting nationwide panic in rural, working-dog communities. Since then, gundog theft has continued in a big way with 50% of stolen dogs now being gundog breeds, with hundreds of Cocker and Springer spaniels (378/354) and Labrador retrievers (547) being reported missing to DogLost in 2014 and so far the figures are increasing from the previous year! It is evident that despite organisations such as DogLost, the Stolen and Missing Pets Alliance and Pet Theft Awareness being established to try and reduce gundog theft, there has been minimal to no reduction in the crime. Whilst these might be working animals, they are still dearly beloved companion dogs whose abduction causes untold heartache to their families. Cocker spaniels, Springer spaniels, Pointers and Labradors are the dogs most commonly stolen – dogs which thieves consider to represent highly saleable assets. Not only are these dogs attractive, obedient, intelligent and very trainable, they are easy to access in their outdoor kennels and outbuildings. Canine field sports are popular in rural areas and the demand for biddable, all-round working dogs has increased, subsequently pushing the price of acquiring one through the roof. For this reason, the market for stolen gundogs continues to exist, with many people being unwilling to purchase from accredited, but less than affordable, gundog breeders. As with all theft, the motivation is nearly always financial. In the case of gundogs that have been specifically trained to point, hunt and retrieve – putting food on the table for their owner and family – the interest in these dogs has never really declined. Because gundogs tend to work together and are usually housed together, either in secured kennels or protected outdoor enclosures, they are seen as easy targets by organised, opportunistic and spiteful thieves looking for their next monetary windfall. Demand for these working dogs on the black market means that many gundogs are stolen with their breeding potential in mind. Demand is not the only motivation for this terrible crime. Many gundogs have been stolen that are past the age of producing offspring, just as sires have been returned or abandoned when they are still in their breeding peak. The number of independent cases of gundog theft is staggering. In some cases, hefty ransoms are offered for the safe return of a dog, although many argue that this only adds fuel to the fire by providing another motivation for theft. The owners of gundogs are a particularly vulnerable community, not only because of how and where their dogs are housed, but on shoot days when these dogs are kept for short periods in the back of a vehicle. Even in crates, targeted organisations can access your car and remove your animals, usually without being detected. For this reason, many owners opt for tinted back windows, use tailored locks on their dog crates and doors, and ensure their dogs are micro-chipped in case of their disappearance. Due to the inherent nature of gundogs to be obedient, trusting, mannered and loyal – traits that endear many of us to them in the first place – coaxing them away from safe areas is not always difficult for the determined dog thief. There are those that like to speculate it was the 2013 Scrap Metal Dealers Act that caused the problem by reducing people’s chances of income. In turn, this led them to look for new avenues of profit, which is precisely where gundog theft came in. Others blame the increase in Cocker spaniel theft on the Duke and Duchess of Cambridge who acquired one the Christmas before last, which led to heightened demand for the breed. In truth, it is difficult to understand why anyone would steal a dog to satisfy their greed, but there is nothing to indicate gundog theft is on its way out. So far this year, reports indicate that 361 Cocker spaniels, 254 Springer spaniels and 465 Labrador retrievers have been stolen across the UK and the trend looks set to continue. Sometimes, not even elaborate alarms, padlocks or security systems will be enough to prevent targeted crime, but they will at least go some way in preventing opportunistic crime which is just as common. Be aware of the threats and remain vigilant, sensible and forward-thinking - it will make all the difference. Feel free to contact me directly with any further questions and/or suggestions for future blog posts: [email protected]. This is disgusting and despicable. Taking a beloved dog, part of the family is evil. How anyone can do this is beyond me. The punishment just isnt enough.